It does not take one too much time to realize that New York is one of the most tolerant cities in the world. Or simplier said, the Newyorkers just don't care. They don't care if one wears the latest designer clothes or the dirtiest rags. Would you like to put a pink feathers in your hair, paint your face black and white and drag chains behind you? Please do, but do not expect that anyone will turn their head after you. No one will care. Only tourists with maps will take pictures. Pink feathers, painted face and chains are not enough to become one of the elite New York freaks. The ones who make natives to turn their heads. It is very safe to say that till yesterday I have never crossed that very distant line and draw attention to myself. 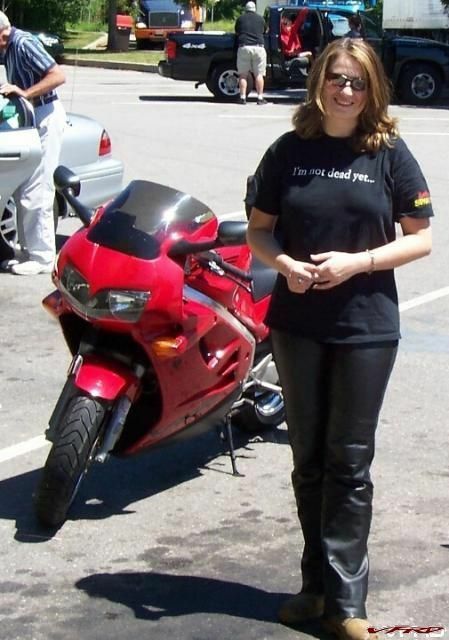 Even when I was in full leather motorcycle outfit, hopping through New York streets on one foot, in one hand holding helmet and supporting myself with a broom in the second. Even then, I was just part of the everyday crowd. However, I am afraid, yesterday evening it happend. I became one of them. One of those freaks who make the natives to stop in what they do and just gawk. And yet, I did not feel out of my element; Part of my daily life is reparking the motorcycle from one side of the street to another - four times a week. Street cleaners and the police are good enough reason to wake me up in the middle of the night horrified that I forgot to repark the bike, put on the t-shirt and run into dark streets to do the chore. Last year I made the effort to always go home, put on some leather jacket, take a helmet and repark the bike with at least some protective gear. This year, I have become slopy. I just stop by the bike on the way from work and repark it. Usually I don't have to ride more than several yards. But yesterday night, the parking gods were against me - the nearest free spot was about 500 yards away and in the 'wrong one way street' direction. Next entry I Am Back ! It's just another story without pictures, you little HottieCzech! Ha,Ha,fun to hear other NYCrs have to do the Street Cleaning Shuffle.Don't know how many times I came home after a night out(not on the bike)feeling very "happy" and not worrying bout moving the bike,only to wake up in a fog wondering if it was on the right side,did that for 10 years till I decided the garage is the only way to go as I had some fine bikes wreaked by NYC demolition parkers. Martinka let me know if you and your ridin buddy's want to venture north.I have a place near Woodstock,so I gotten to know the nice roads up there,colors are going to be great in a few weeks.Also pickin up a VTEC next week so cant wait to get back in the V-4 fold! (As you've always known, you may flame me as much, as you please). It is always an eye-opener to look at yourself through the eyes of others and to realise that your behavior, however innocent it may be, can be viewed as freakish by the "normal" people. I'm glad my wife doesn't read this forum ... I think I'm in love, again. Round here in my small town, just wearing my high-viz vest, some people look at me like I must be queer. Martina- So many years in Brooklyn, I just pulled the velcroed on plate and chained it to a light pole with a Fuggehdabouddit chain. Well worth the hassle. I did read about the guy who had his 75 Norton Commando crushed by the santitation dept. though. cgroshart_at_comast.net. I was going to send you info on the STMC club. Thats Brooklyn though. Plenty of places where cops wont say a thing. I see bikes parked against the side of buildings, next to street sign poles and even on those inverted U bicycle racks popping up all the time with no hassle from the law. But its nice to have a front porch of my own, although I'd much rather have a garage so I can at least work on my bike at all hours of the day.